Fifty years ago, on October 20, 1962, with the world’s terrified gaze fixed firmly on the U.S.-Soviet nuclear standoff in Cuba, China attacked India. Provoked by a territorial dispute and tensions over Tibet, the war was brief and China emerged victorious. However, the war still casts a long shadow over Sino-Indian relations and, despite substantial improvement over the years, continues to influence the bilateral relationship in three principal ways. First, the war of 1962 sealed the fate of the Tibet issue as an eternal source of tension in Sino-Indian relations. Long before the war Tibet began to plague Beijing and Delhi’s relationship as China accused India of trying to undermine its rule in Tibet while India charged China with suppressing Tibetan autonomy. The war served to solidify those suspicions. This has had both strategic and tactical consequences. Strategically, the Dalai Lama’s presence in India, which the war made de facto irreversible, is a constant strain on Sino-Indian relations and the embodiment of the unresolved status of the Tibet issue. For Beijing, the Dalai Lama’s government in exile in Dharamsala has been a constant challenge to its rule in Tibet. For Delhi, it has been a symbol of Beijing’s refusal to grant real autonomy to Tibet. It has also proved a double-edged sword for India. While it has given India the so-called “Tibet card” to play against China, it has also boxed it in as Delhi cannot control the Tibetan leader nor throw him out for fear of the domestic and international reaction. All this has guaranteed constant tensions between the two Asian giants. On a tactical level, Sino-Indian relations have been held hostage by events in Tibet and the relationship between the Chinese government and the Tibetans. As C. Raja Mohan has characterized it, “When there is relative tranquility in Tibet, India and China have reasonably good relations. When Sino-Tibetan tensions rise, India’s relationship with China heads south.” However, as such tensions reflect ethnic conflicts inside Tibet, clashes between the Tibetan clergy and the local Chinese authorities and the policy of the Dalai Lama, they are often beyond the control of Beijing and Delhi. As a result, Sino-Indian relations have become difficult to predict and more difficult to manage in times of crisis. This inherent instability has been aggravated by a time bomb which can explode anytime, the inevitable reincarnation of the Dalai Lama. Second, 1962 has bequeathed to China and India the border dispute that started the war and has made resolving it a Herculean task. Thus to this day China continues to claim the Indian state of Arunachal Pradesh, while New Delhi lays claim to the Chinese-controlled Aksai Chin territory. This dispute continues to prevent the full normalization of relations despite almost a quarter decade of negotiations and Prime Minster Vajpayee’s 2003 visit to China. Despite efforts to sideline this issue it has not only remained central to bilateral relations, but has powerfully reasserted itself in recent years. 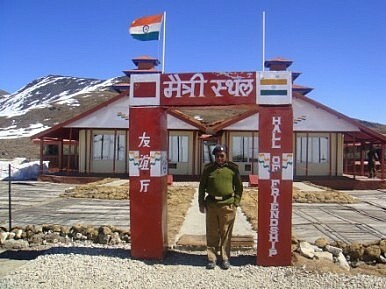 A series of incidents- including Indian officials visiting the disputed areas, Beijing refusing to issue visa’s to Indian officers stationed in the disputed area, and official Chinese references to Arunachal Pradesh as “South Tibet”- have rekindled the dispute and led to a new cycle of accusations and tensions. In addition, the territorial dispute has led to dangerous militarization of the Sino-Indian border, especially in disputed areas. Both sides have built transportation infrastructure, airstrips, and outposts and have deployed large numbers of troops to the border, including a Tibetan paramilitary special force employed by India’s intelligence service. The result has been frequent stand-offs and even occasional skirmishes between Indian and Chinese soldiers. Provoked by border incursions and patrolling in disputed areas, such incidents could escalate into a larger armed conflict. Earlier this year, China and India signed an agreement designed to manage tensions by establishing a mechanism for contact between the two sides in case of border incursions. However, it is uncertain how productive it will be in light of the failure of previous attempts to reduce tensions. Third, the border war has instilled deep mistrust and a strong sense of rivalry between the two sides.